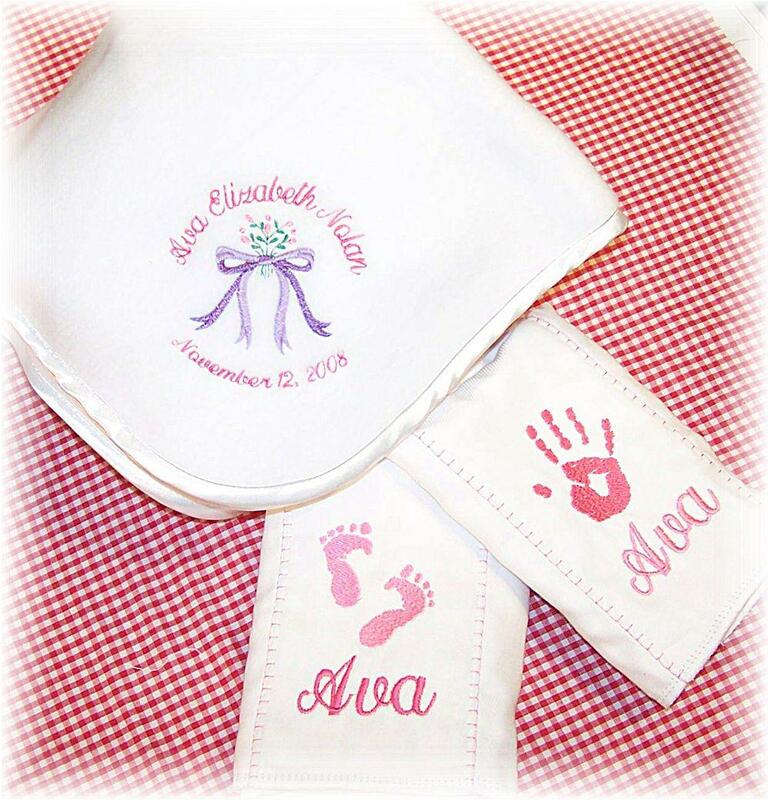 All Personalized Baby Gifts are Created & Shipped in 10 Business Days or Less (rush orders available upon request). USPS Priority Shipping is $8.25 and Gift Wrap is FREE. Personalized pampered baby gift set. Destined to become baby's favorite comfort object. This personalized cozy satin-bound fleece baby blanket is top quality! They wash like iron and will withstand years of loving. Ultra-soft and light weight it measures 36" by 48". Blanket Color: Light Pink, Light Blue and White. Personalized blanket is embroidered with baby's full name over the design and the date of birth below the design. AND Two white diaper service quality nappies that you can personalize however you please. 100% Cotton Heavy Duty Diapers - Used as Burp Cloths. Each fluffy diaper measures 112" x 15". Design: Select any Design(s) from the "See All Designs" Page. Lettering for Nappies: Select Color, Style and Case. Friends from work sent this lovely gift set. It was the most thoughtful gift my daughter recieved. The blanket is her absolute favorite comfort object and the burp cloths are so so handy and soft! Dear Alison, Thank you SOOOOOO much for including the picture of the finished designs. What a lovely touch. I really feel like I was part of creating this special gift for Gabbie as well! I'll be back soon to create something wonderful for my niece ;o) I'm so glad Susan told me about babyobaby.com! Alison, I just love everything you make. It is so hard to pick but, I know whatever it is, it will be gorgeous! I just love giving this gift. It makes a beautiful presentation but, then they actually get used and loved even more. Thanks! I just wanted to thank you for such a lovely gift! This is our absolute favorite gift that we received when our son was born. I am visiting your site today to order 2 sets for friends from college. I am so excited for them to receive it!!!! Genius idea! We love both these products and now we can get them together. Yeah, love it! Alison, I want to thank you personally for the lovely gift set you made for my daughter. When my sister presented the gift bag to me, I had no idea what to expect...when I opened it up, I cried like a baby. You see, my husabnd and I have waited for 12 years for our miracle baby. We knew her name long before we knew when should would arrive and then finally that magical birth date! Your gift was so elegant and absolutely perfect we will treasure it forever! This set is just too pretty to use! My husband thinks I'm crazy but, I don't want the baby to touch this stuff! Hi Alison, I just wanted to thank you for your part in giving this extra special gift. My sister and her husband were unable to have children on their own and after years of "trying" were finally able to adopt a precious baby girl. You can imagine tears all-around as this gift was opened soon after Jennie's arrival! I am so happy that my friend shared your web site with me. This is such a wonderful gift. I commend your high standards in your products and your exceptional level of attention to the customer. You really went above and beyond.... I really love your stuff! Hi Alison, My favorite gift to give has always been the fleece personalized blanket...I just saw the new gift set that includes the burp cloths too. This is brilliant! I just sent one to my cousin in LA...I know she will absolutely love it! Thank you. My co-worker told me about your company and now I give all of my clients this gift set as a gift for their newborns. Not only is it easy to place an order, I always get an incredible reponse from the new parents. Thanks for helping guys give great baby gifts.